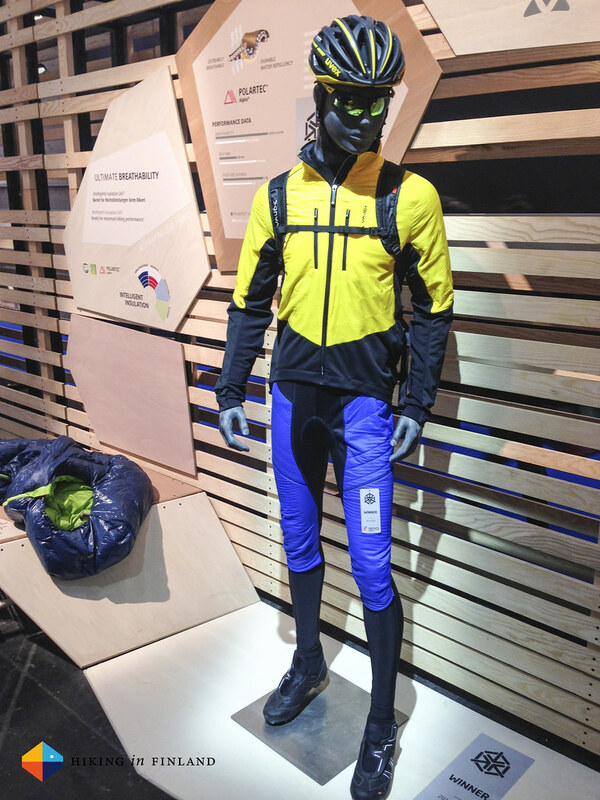 A bunch more new gear for the trailrunner, the backpacker, the climber, the skier, the cyclists and simply anyone who likes the outdoors, or gear, with a look at trends, a dozen other blogs that reported on the fair and a final conclusion of the 2015 ISPO in München. Late to the Party? Read the other updates for more Gear News: Part 1, Part 2 and Part 3. Lets look at these in detail. 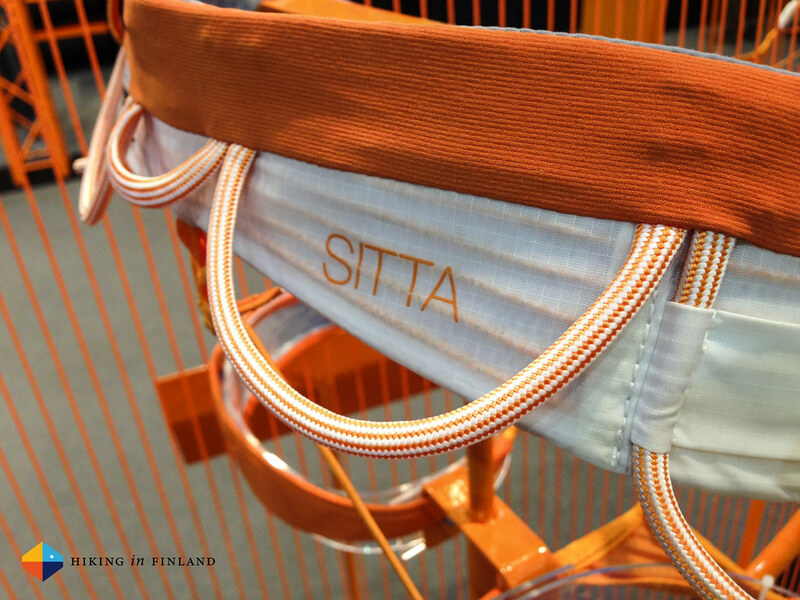 The new harness obviously immediately had my interest, as it’s lighter yet again as the Hirundos (that I have here and which is already damn light at 280 g in Size Medium) - the Sitta will be 250 g in Size Medium and a sweet 230 g in Size Small. The Wireframe Technology which this harness uses uses Dyneema strands in the waistbelt and leg loops and which replaces webbing and foam in normal harnesses. It’s a very compact harness with a beautiful design that’s slim but still packs all you need from a harness: Two rigid front gear loops, two flexible back gear loops, two Caritool slots and a rear loop for a haul rope. It’s made of Bluesign® approved fabrics, too. Psyched about this one! The new RAD System, (Rescue And Descent) is an all-in-one set for skiers that allows you to set up an crevasse rescue, rappel or rope up on a glacier. The set contains three Attache carabiners, one storage bag, one Tibloc, one Micro Traxion, one 120 cm sling and the 30 m RAD Line, a newly developed 6 mm cordage which allows you to do a crevasse rescue, rope up on a glacier or rappel. The whole set weighs in at 1.045 g which is quite a bit lighter as other options, and also very compact. The cord tips the scales at 660 g for the 30 m, that’s 22 g/ m. It’s a static cord with less than 2% stretch which makes it great for rappels and rescue actions and minimizes yo-yo effects. It’s something any backcountry skier usually will carry, though nothing yet packs down as compact and light as the RAD (4 l pack size!). The Positioning lanyards are interesting. 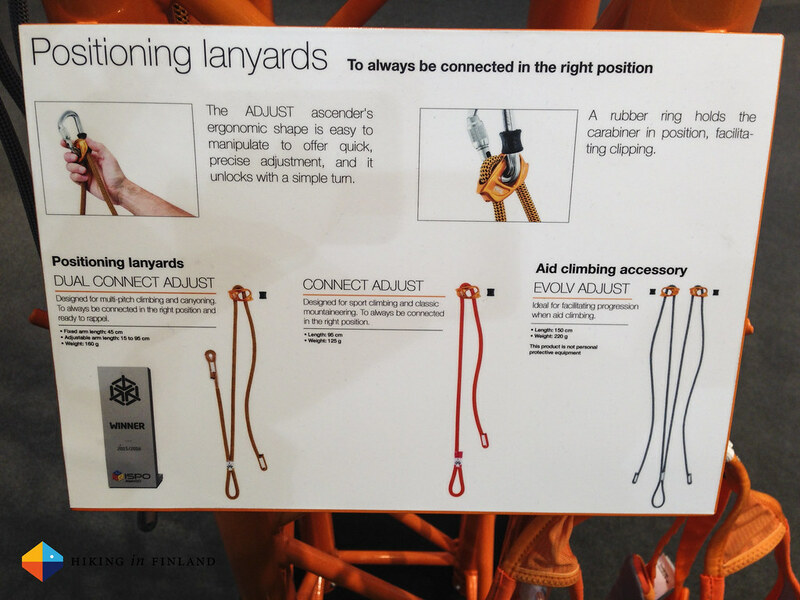 They aim to replace your Daisychain/ 120 cm sling with which you clip into the belay station. 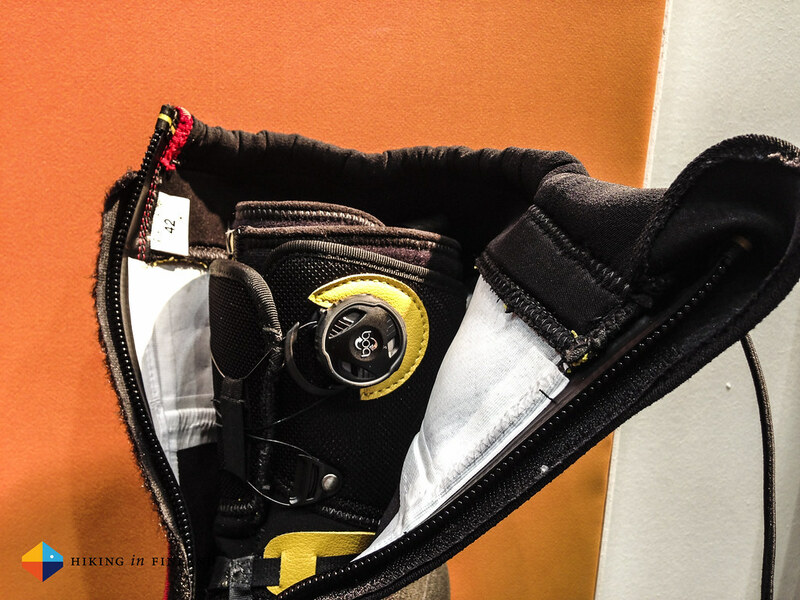 The Connect Adjust is made for sports climbing and mountaineering, while the Dual Connect Adjust is for Multi-Pitch routes and mountaineering. You attach them with a girth hitch to your tie-in point and then clip them out of the way until you need them. The magic happens when you arrive at the belay. With the locking carabiner (not included in the sets) you clip in to the belay, and then can easily adjust the length of the lanyard with the Adjust ascender. The lanyard is a dynamic rope which can reduce the force in case of a short fall. The Connect Adjust tips the scales at 125 g and the Dual Connect Adjust at 160 g, and will need one or two locking carabiners respectively. 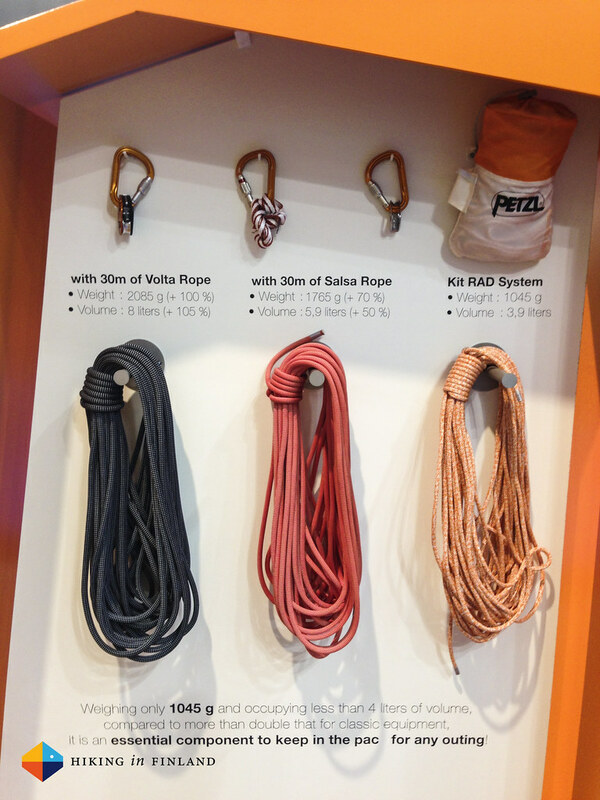 Knowing how much discussions we have in our climbing club about slings/ daisy chains/ Personal Anchor Systems I reckon these will be hotly discussed, too. Personally I think they are great ideas which can make adjusting the length at the belay a lot easier and possibly safer, though they’re a tad heavier than normal systems (which in turn are a lot heavier than just tying in with a Clove hitch). 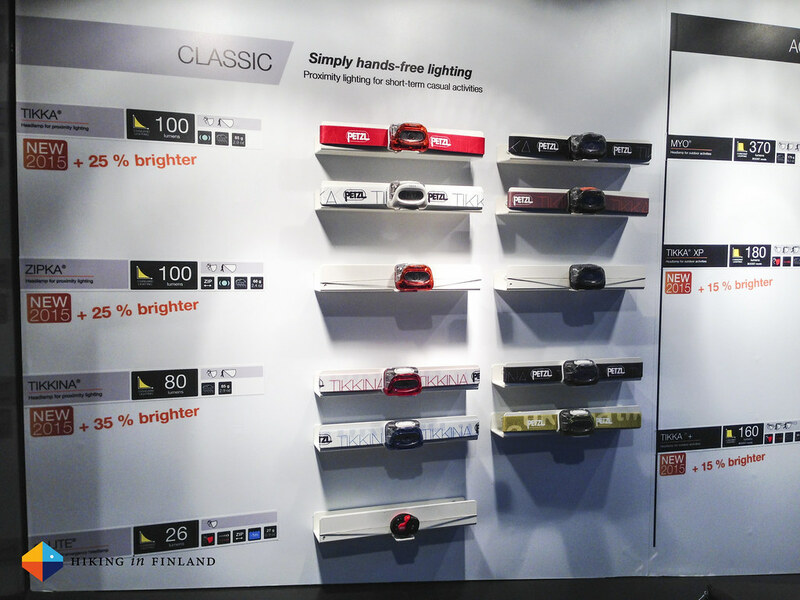 The headlamps line got a refresh, and many models got more power (= Lumen) and there’s also a hole bunch of new, fresh colours. The Tikkina, Tikka and Zipka headlamps went up to 80, 100 and 100 Luen respectively, the Tikka + and the Tikka XP went to 160 and 180 Lumen and the Tactikka + and Tactikka +RGB are headlamps in more toned down colours (all black, desert and camo) are for hunters and fishermen. Both come with 160 Lumen output and have different light options which allow for stealth and keeping your night vision. Scarpa goes wild with the Mojito Wild. 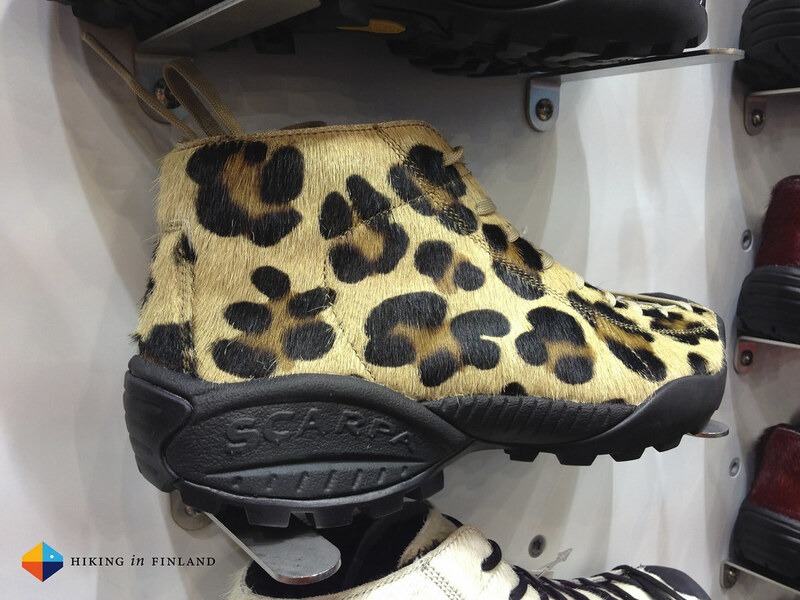 The upper is made of spotted or plain color “cavallino” leather and the sole is the Spider Trek sole in all black. They’re probably going to be wildly popular, as I imagine the Mojito Patchwork will be, where every shoe will be totally unique as they are hand-sewed, with each square being different thus making every upper completely unique. On the other hand you have the Alien 2.0. 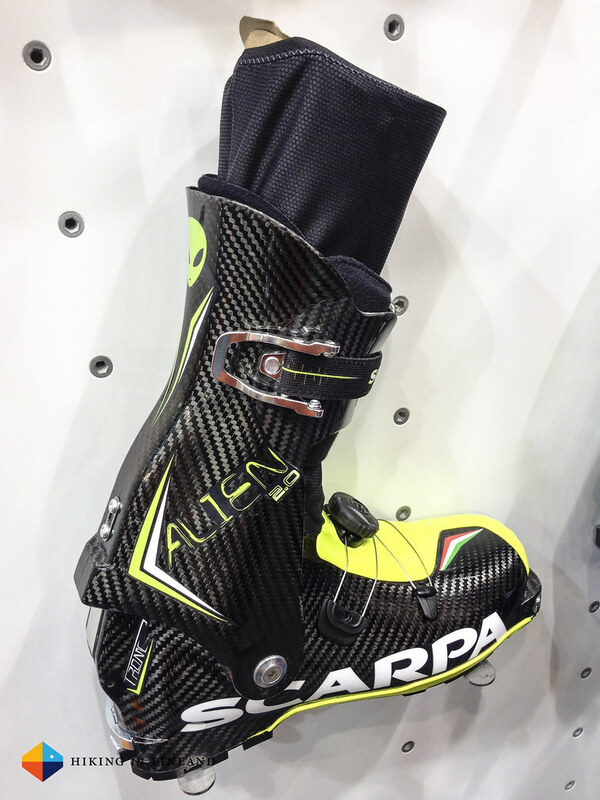 It is a race boot that employs the Tronic technology – a ski/ walk mechanism that automatically blocks the cuff to the shell simply by inserting the boot into the binding which should give you an advantage during a race when every second counts. It has an internal gaiter and a full carbon shell and cuff and it is closed with the Alien Fast Buckle Closure and the Boa Closure System. 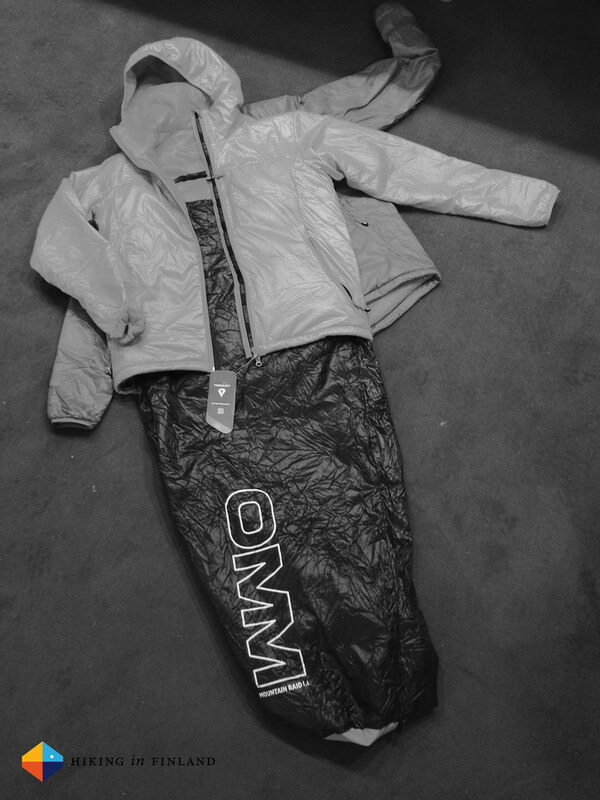 I really like to stop by at the guys from The OMM as there is always cool gear to be seen. 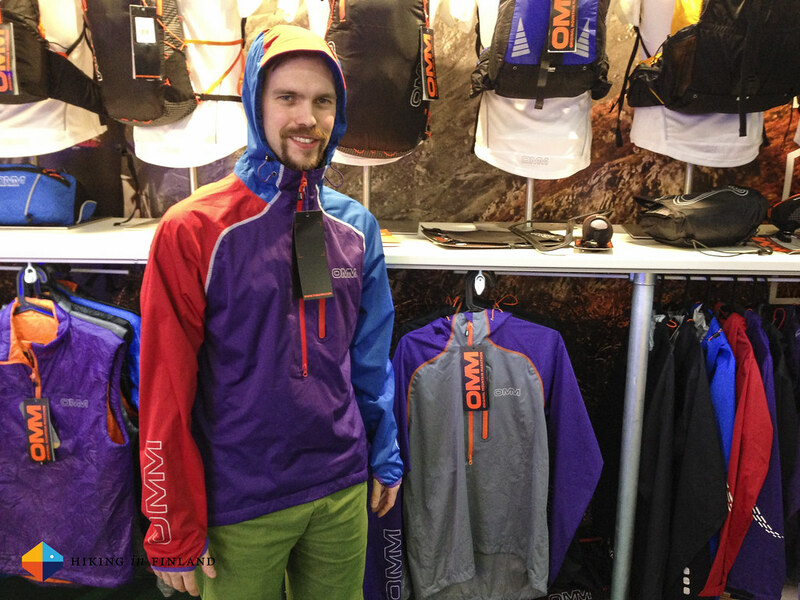 Take the Mountain Raid Jacket & PA 1.0 Sleep System above. 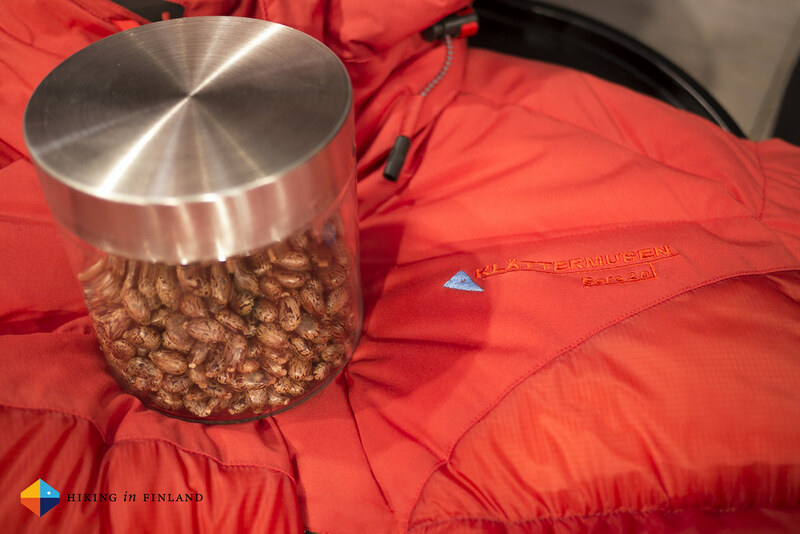 Both garments are filled with Primaloft Gold and weigh 390 g for the Jacket and 235 g for the half-bag. 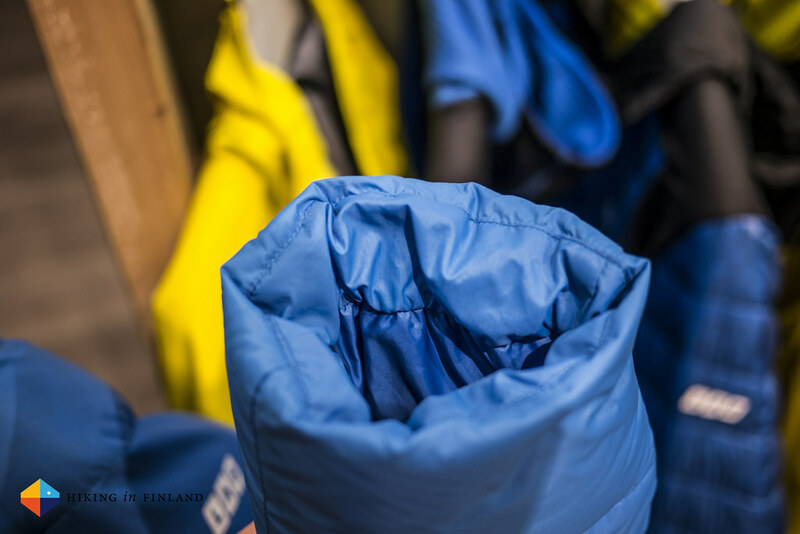 The Half bag connects via push buttons on the inside of the jacket to it to create one versatile sleeping system that weighs in at 625 g. The half-bag also has a draw string to pull it tighter and packs a mighty fine 16 x 11 cm when its in your pack. This will be a hot item for runners and (S)UL Backpackers alike I think, it’s a great execution of the “Multi-use” idea. 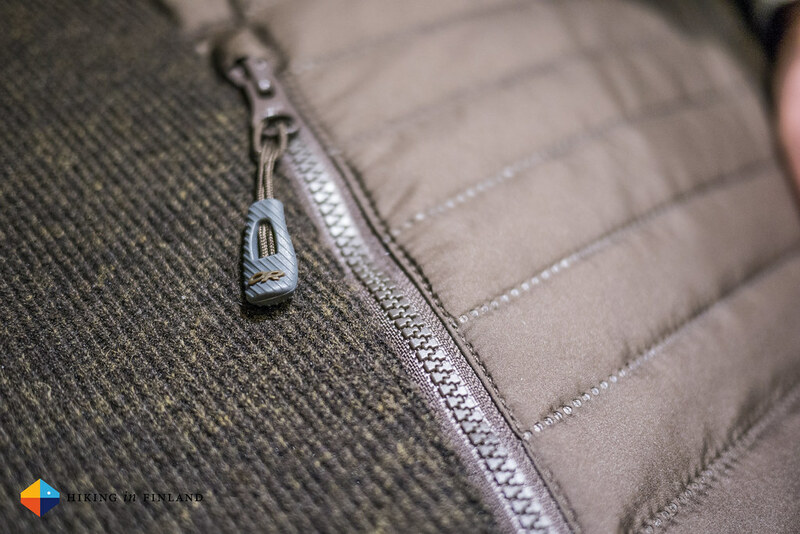 The Rotor Vest tips the scales at 135 g and is filled with Primaloft Gold in a 40 g weight variation. It packs rather small as I show above when you don’t need it, but when you put it on you’ll be toasty. It has a zipper so you can dump heat, a hem drawstring and the chest pocket also functions as the stuff sack. The Purple colour above also looks superb! The Kamleika Race Smock II above isn’t new but the colour combo is and I’m totally in love with it. Extreme Food had one of the most fun booths on the show. 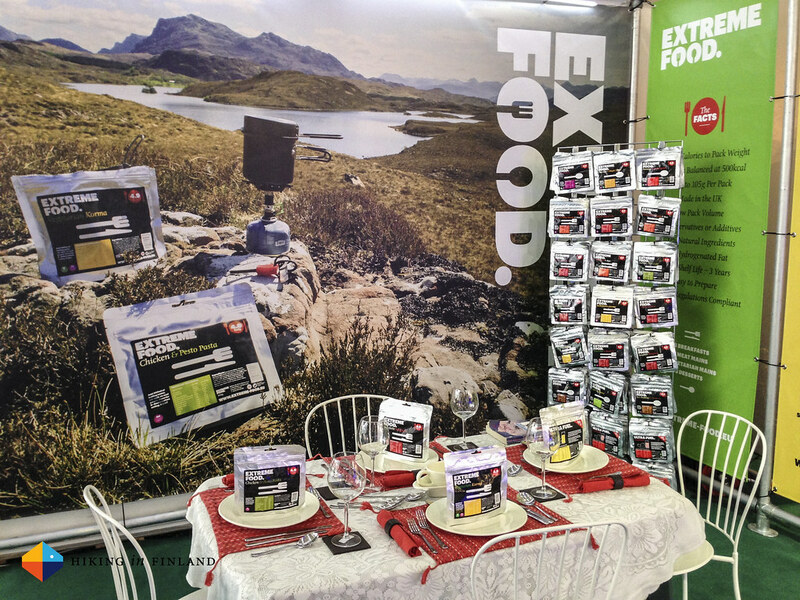 It was simple, but the juxtaposition of fine porcelain, sterling cutlery and wine glasses with a fine course of freeze dried food in a bag was just great. The food is made in the UK from high quality natural ingredients with no artificial colourings or preservatives, and I have seen some UK tweeps already tasting it and finding it delicious. And what’s pretty awesome about these meals is that breakfasts, mains and desserts all have a superb weight-to-calorie ratio: A minimum of 4.8 kcal per g! That means each pouch weighs 102 g and gives you 500 kcal, which is pretty lightweight. Best of all, they’re available already! 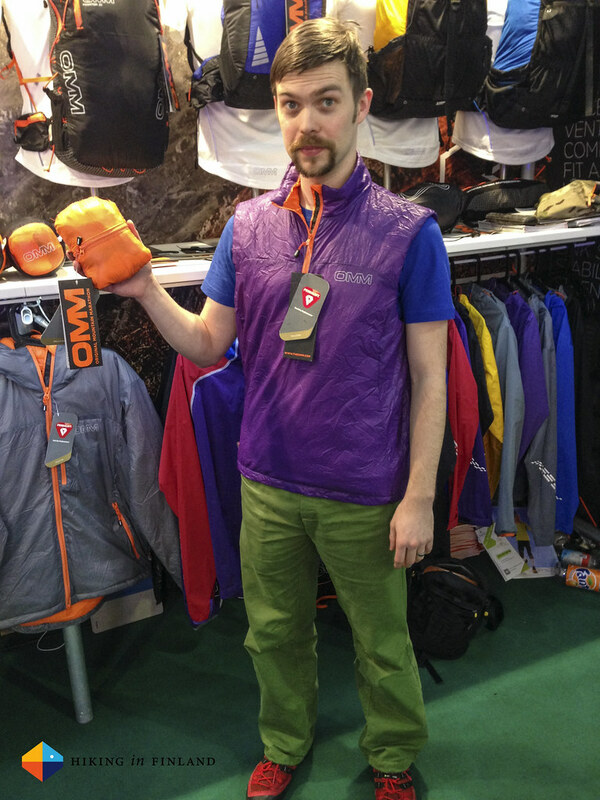 Salomon had so much new stuff on the show that it’s hard to narrow it down. 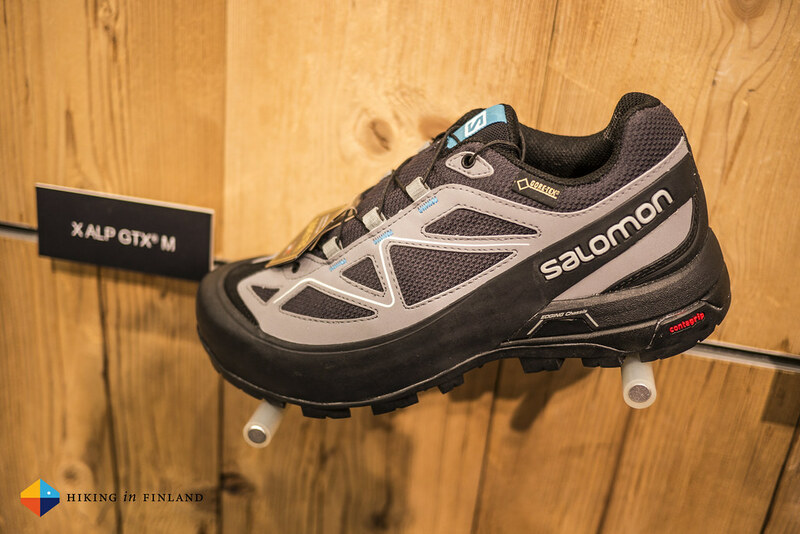 Lets start with the shoes, shoes at Salomon are always worth checking out, because they’re damn good. 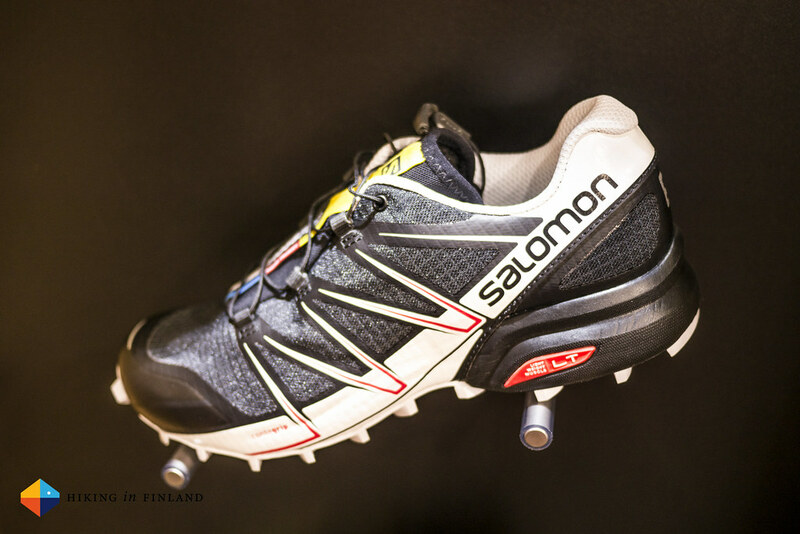 The X Alp GTX M Approach Shoe is the small sibling of the Salomon S-Lab Alp Carbon GTX, the mountaineering boot I already found awesome at the OutDoor 2014. It also employs a carbon midsole that is laterally stable but otherwise flexible, so should be great on these Approach shoes. They should arrive for test this week, so keep an eye on Facebook and Twitter for some tidbits on them. 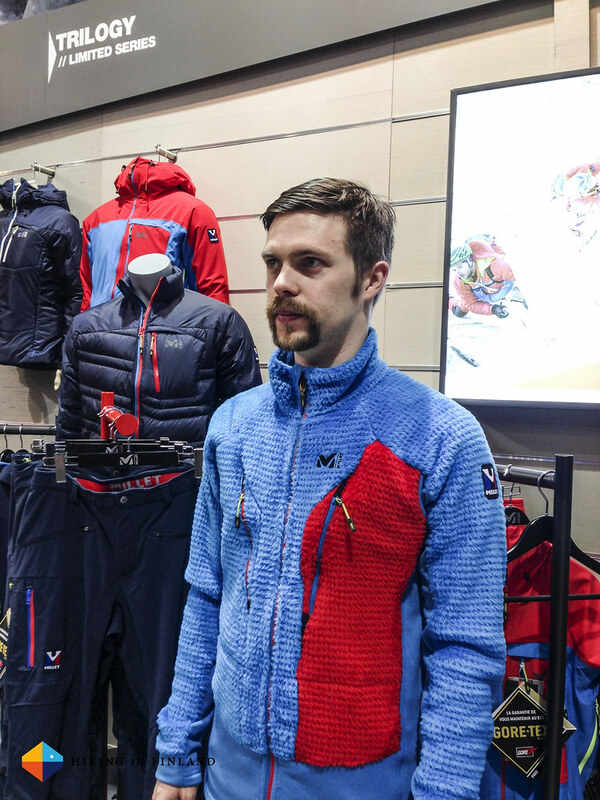 The Salomon S-Lab gear is probably some of the most advanced kit on the market and Kilian Jornet’s thoughts and feedback go into it. 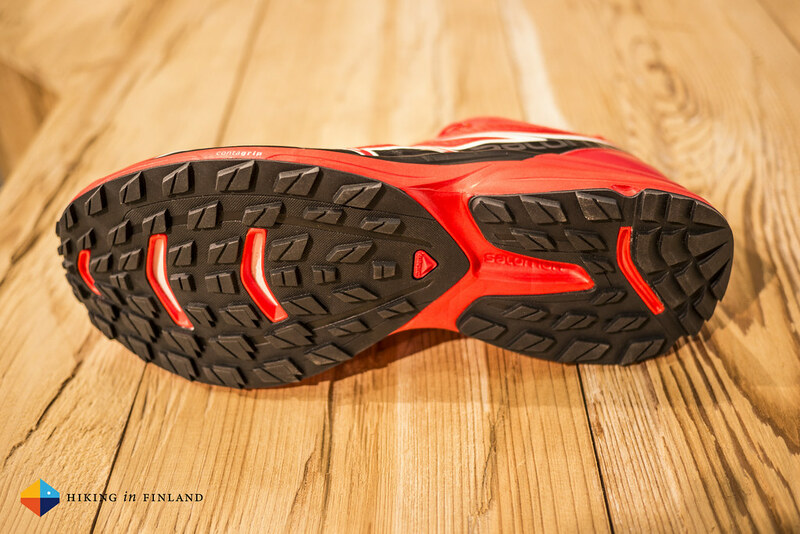 The S-Lab Wings above is a universal shoe for your trail runs that excels on the way down. 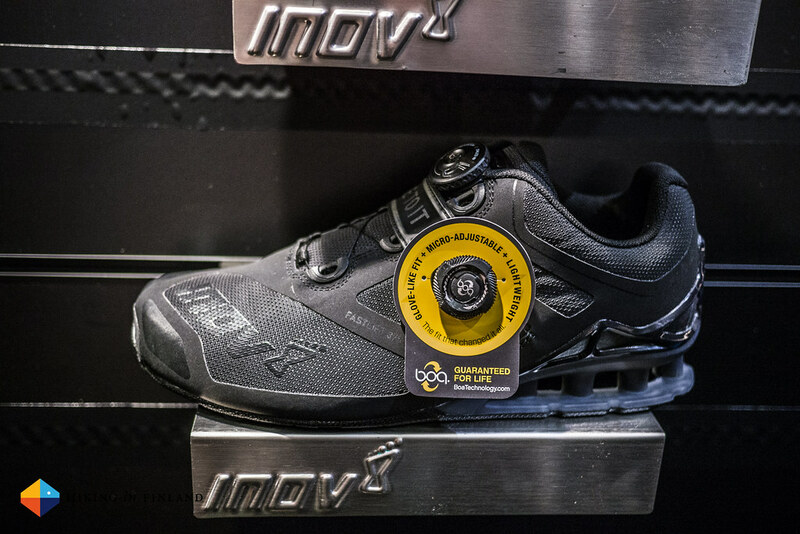 This gives you more protection on the downhill and has a great fit in the heel thanks to the combination of Descent Control and the SensiFit-System, so that your foot doesn’t move to the front or sides. Shoes for less serious trailrunning were abound, too. The Speedcross Vario is the shoe for harder trails in dry weather, while the Speedcross Pro is great on wet and soft terrain (= MUD!). They’re built on the Speedcross 3 model with different soles and thus if you love the Speedcross 3 but need a shoe that’s better in soft and moist terrain, grab the Pro, or if you run usually in dry, desert-like terrain on hard trails the Vario will be for you. Why? 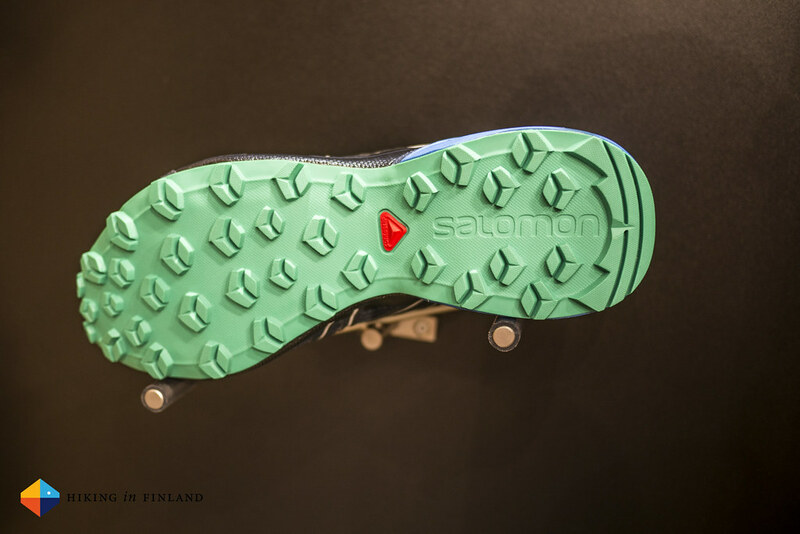 Well, the Vario’s profile is larger and hence gives more friction on the ground, and there’s also more cushioning. The Pro on the other hand has the Mud & Snow Contragrip sole, with smaller and more aggressive cleats. In the Pro your foot sits deeper in the shoe for a better ground feeling, too. 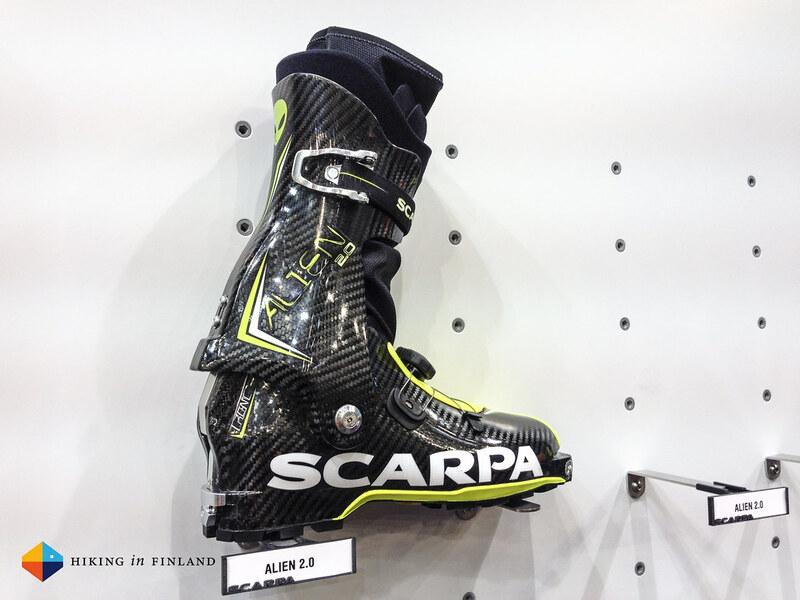 The Carbon Ski enthusiast will be delighted by this combo. And the Freerider/ Powder enthusiast might consider a Skitracer the next time he drops into 3 meters of fresh pow and loses a ski. Because with the skitracer he’s able to find the ski again when it has hidden in that sweet powder. Klättermusen now entered the leguminous plants business. I think that’s rather smart, beans are after all super tasty and if you can make shell material out of them instead of oil - hey, that might mean some idiot oil company might not need to go and ruin the Arctic for us and the polar bears! 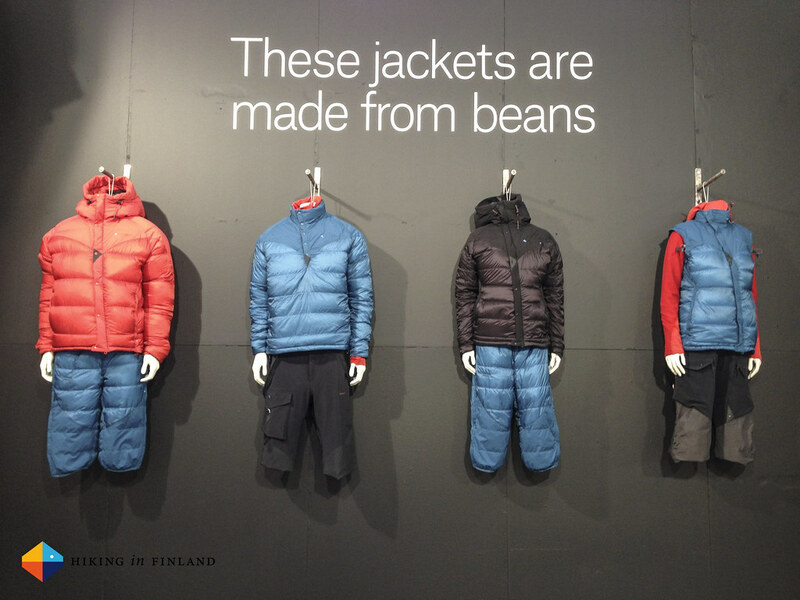 The Nylon in their new insulation garments is made of Castor Seeds, which Toray and Klättermusen have developed together. At the moment the Nylon is made out of 60% plant-based raw materials but both companies work hard to bring this up to 100%. The plant-based nylon is supposed to have the same qualities as crude oil nylon, and at least trying them one and checking them out I wasn’t able to tell a difference, which is positive. The Bore 2.0 Jacket that Malin models above packs 300 g of 800+ cuin goose down and Primaloft Silver ECO in the shoulders and back of the arms. 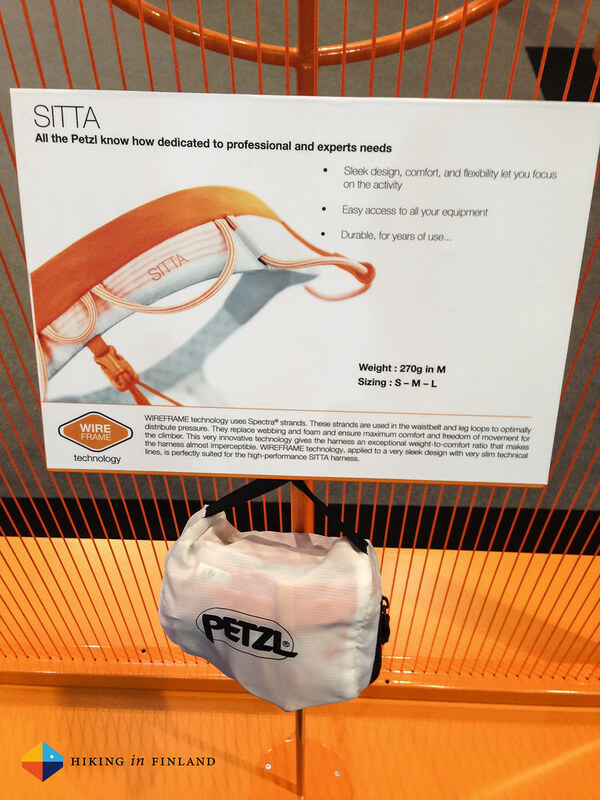 Its shell is made from the new “Bean Nylon” and has a PFOA-free DWR finish on it, is made in a box wall construction and to minimize seams and cold spots the pockets have been moved in line with the side seams. 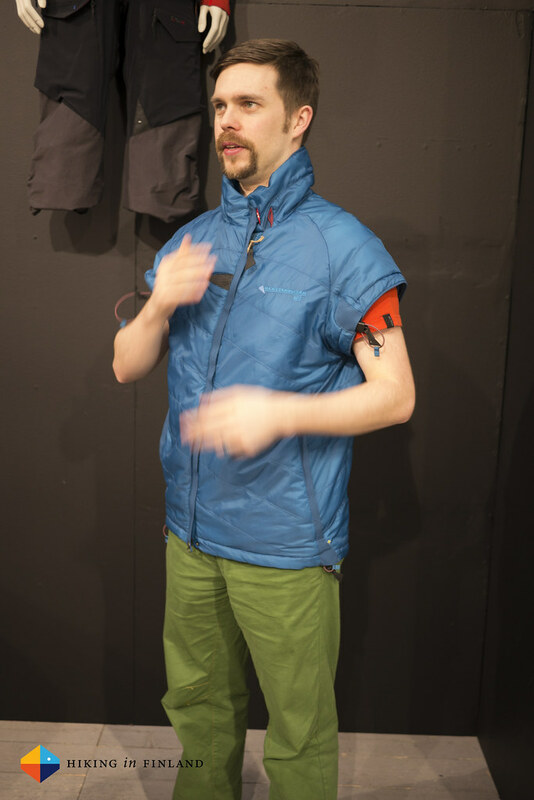 It’s a super-toasty jacket that has a very nice cut, though the price tag of 500€ is pretty steep. The Frö 2.0 Vest is a midlayer piece for winter use with an Primaloft Silver Active insulation. 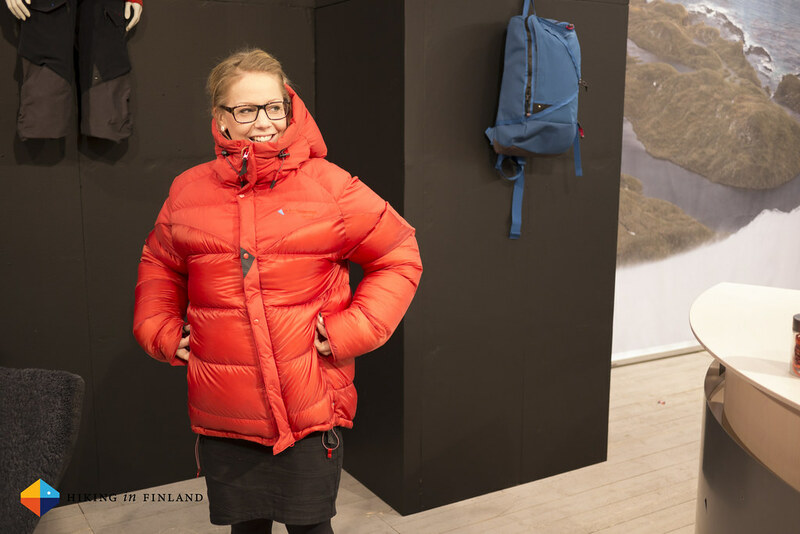 At 250€ it’s more affordable than the Bore 2.0 Jacket but of course not nearly as warm! 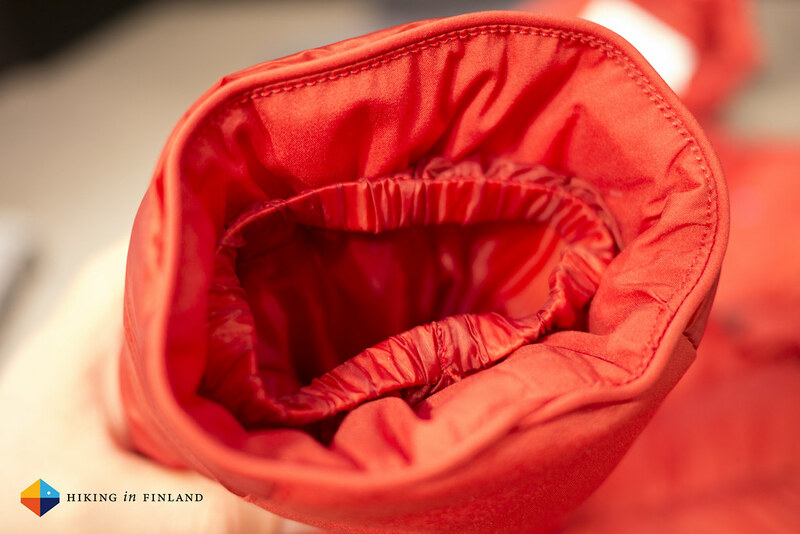 The high collar keeps chilly winds from your neck and throat, you can adjust the arm openings to be closed for keeping the warmth inside or open them for a bit of ventilation. The asymmetric zipper is perfect (all zippers should be asymmetric at the top in my opinion) and if you’re not a Vest-kind-guy-or-gal then you also can get the Frö 2.0 as a jacket. 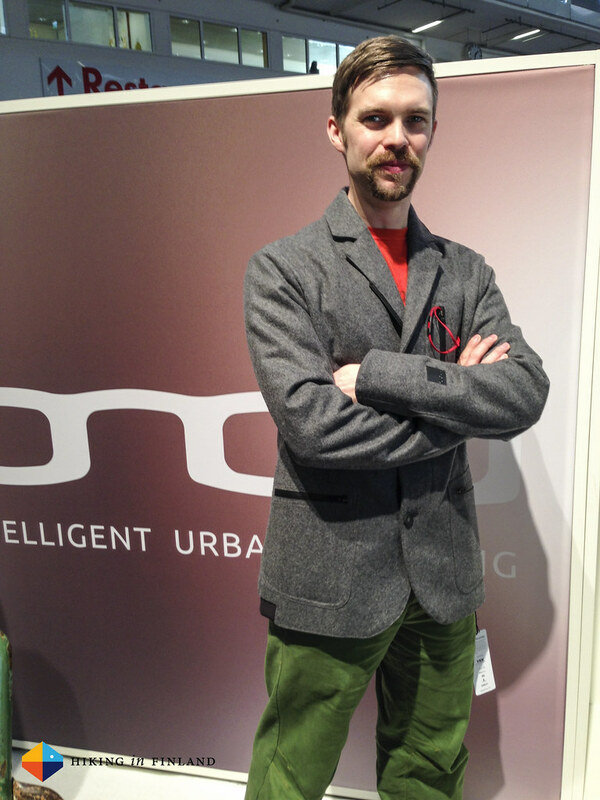 onoo is a young start-up from Munich which gathers to the urban cyclists. It was a bit of luck that I met them and I did like what they had to show. The three jackets all have a cycling specific fit and are from materials that are not worried if rain, dirt and abuse is coming its way. 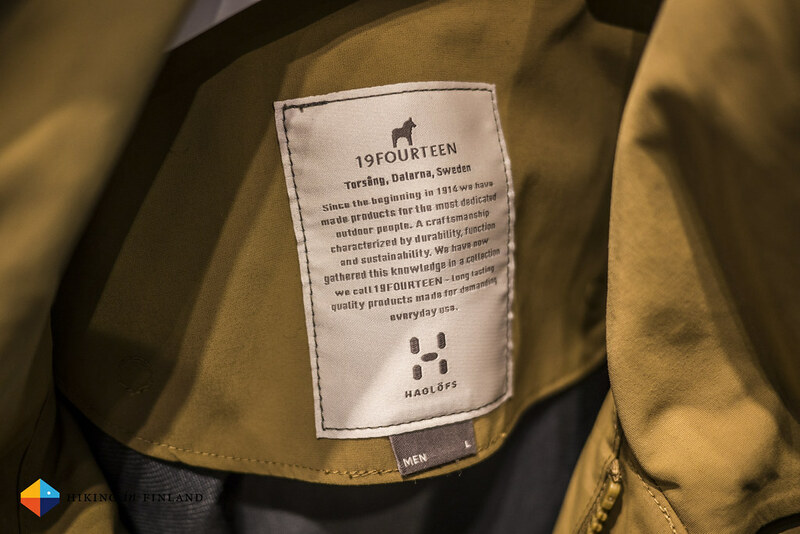 I had fun trying them on and speaking with the founder, and do agree with what he said: People know which jacket will suit them. I tried that one above on first and really like how it looks and feels, and while this one is pretty swell as well it’s maybe a tad less my style?! Check their collection and pick the jacket which suits yours! Getting a meeting at Vibram has been on my agenda for a looooong time, so I was happy that after three years of trying I finally was deemed worthy. 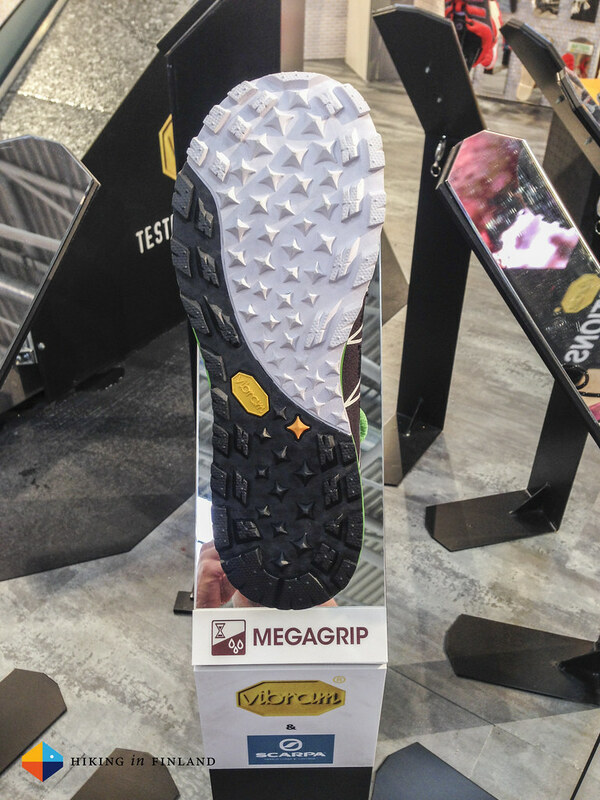 The big news at Vibram was their Megagrip sole, which has apparently pretty awesome grip on wet granite. At least they had a nice test parcours built up where you could try that out, but as I was already running around for six hours on the fair I was a bit shy in sharing my sweaty feet smell with others and so kept my shoes on. 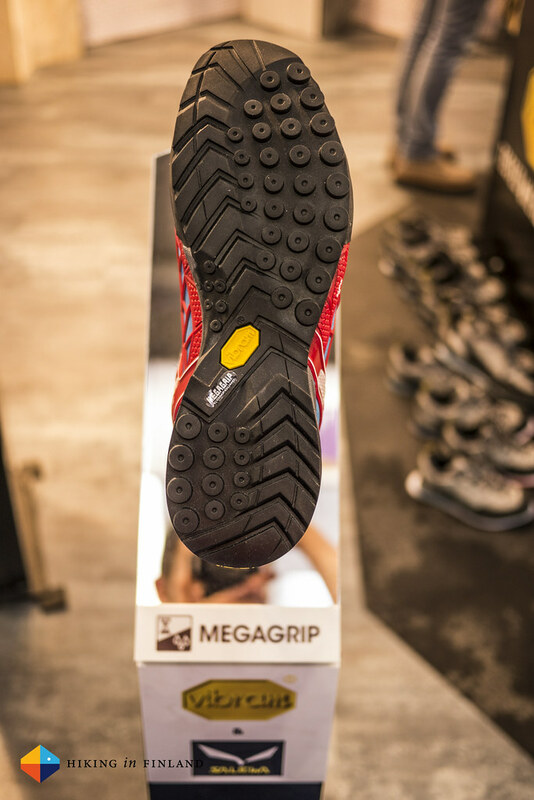 I’m sure some Megagrip shoe will appear at HiF HQ some day in the future, though, and as we have lots of granite in Finland and also no shortage of rain I will see if it performs as claimed =) If you too want to have Megagrip, you’re in luck: A whole bunch of shoe companies, from Scarpa to Salewa & Arc’teryx, have used the soles in their 2015 shoes which are just hitting the stores, so go and get a pair! Vaude is the “small” Family business which still turns out a lot of new gear. Not everything is ultralight though what Vaude really knows is environmentally friendly production. Lots of good stuff they are doing, and either I’m getting older or they’re getting younger in their styles because I did like quite a few pieces from them. The Alphapro Bib Pants above are Winter Cycling insulation Pants with Polartec® Alpha insulation in them and an Vaude Eco Finish DWR. Mesh suspenders keep the bib in place and a Men’s Advanced Cycling seat cushion ensures you can sit long in the saddle. It will weigh around 440 g and is an ISPO Award winner. 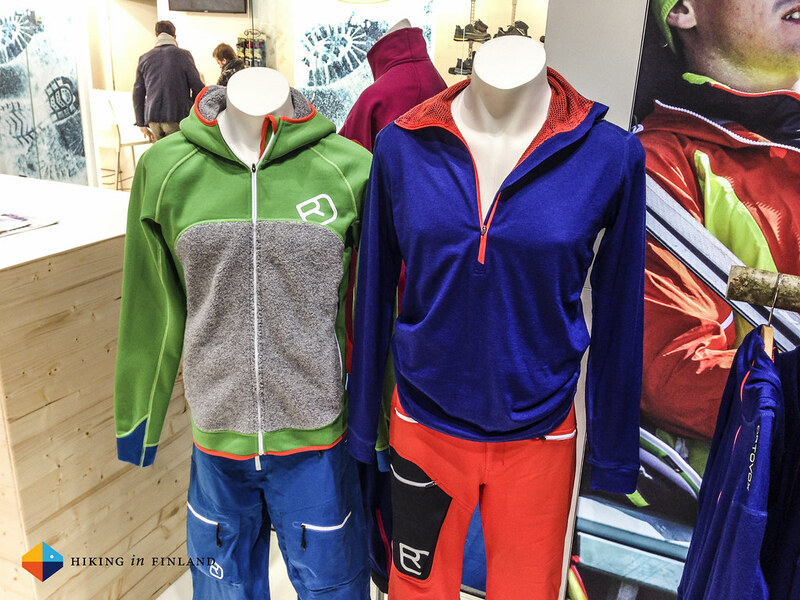 The Primasoft Jacket is a ISPO Gold Award winner and another cycling jacket. 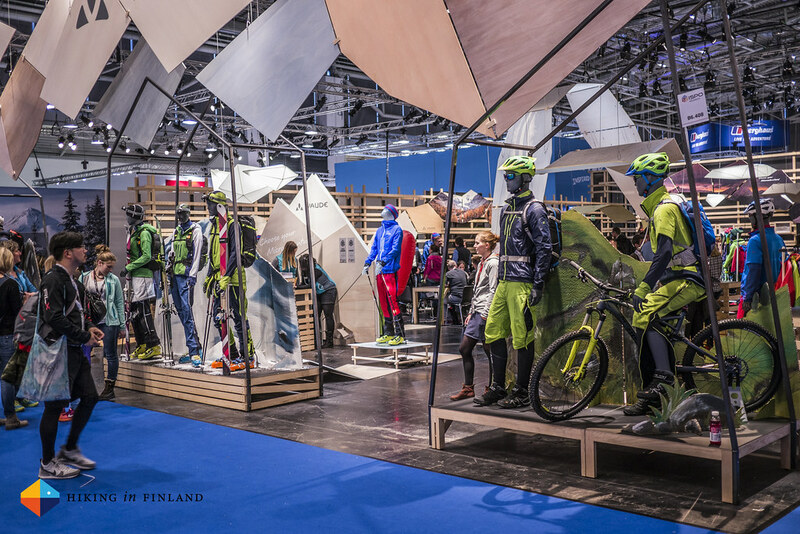 It combines Primaloft insulation materials with softshell materials in 3 different zones and is aimed at mountain bikers who like to ride in winter (Wait, aren’t they called Fatbikers?!). It has Primaloft Silver in the front and back, breathable inserts under the arms and in the back, a softshell material with a membrane in the front and kidney area and reflective details so you’re seen between dusk & dawn and tips the scales at 485 g.
Hestra Gloves make awesome gloves. 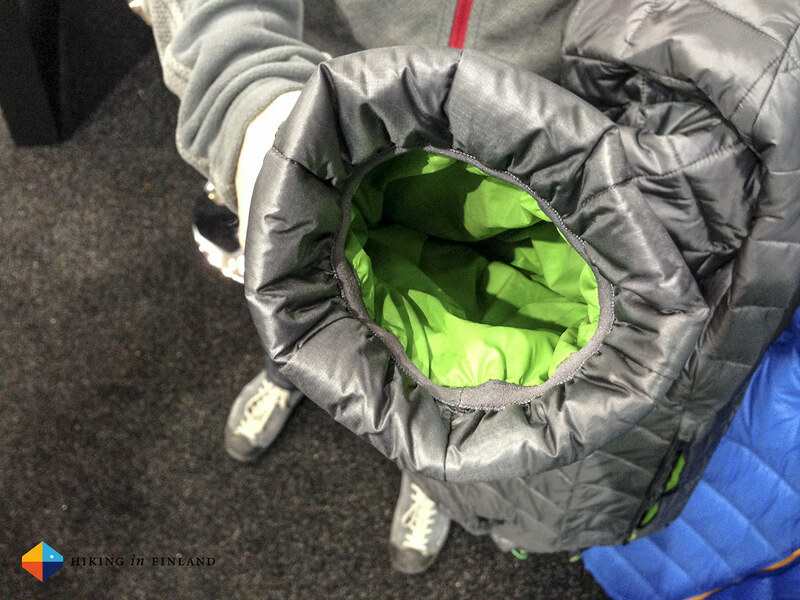 The Moon Mitt above has a Primaloft insulation, a lambskin palm so you can pick up the kettle and has a liner, too. Toasty hands guaranteed. New too is their vegetable tanned leather. It has been tanned using natural tannins such as bark powder. The method produces a supple leather with a unique brown colour and is the oldest known way of tanning. As the Press Release reads, “The look and feel of a vegetable tanned leather is hard to beat and it ages naturally in a beautiful way.” and yes, I agree. 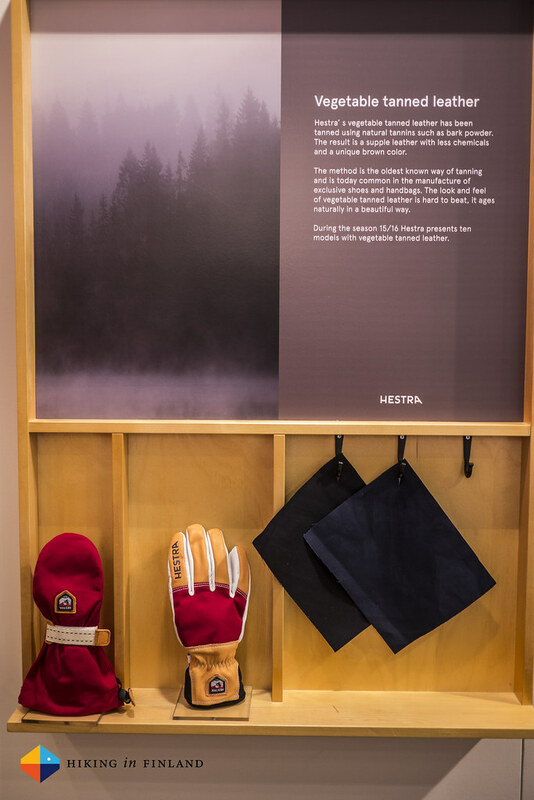 These vegetable tanned gloves were pretty, and the Abisko and Helags Junior Mitt above were very sweet indeed. 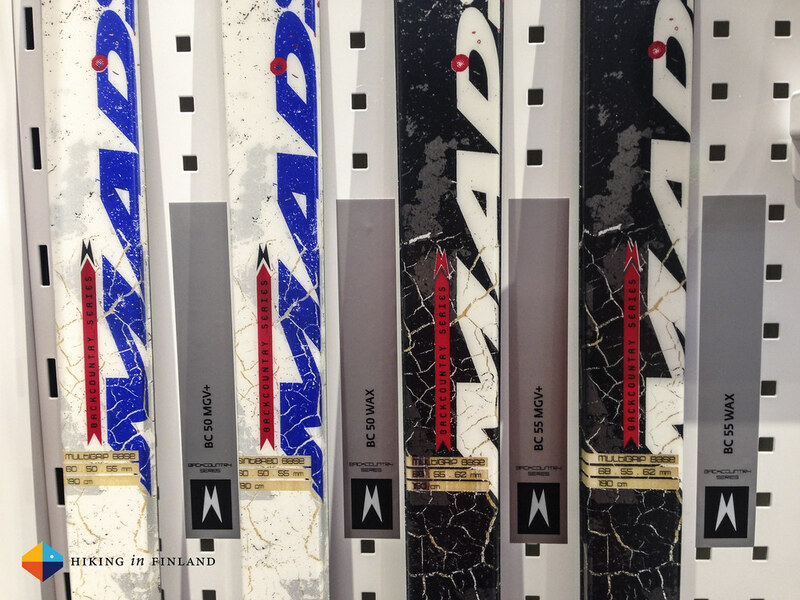 Madshus has been making the IntelliGrip Skins, a special climbing skin for XC skis, since five years. 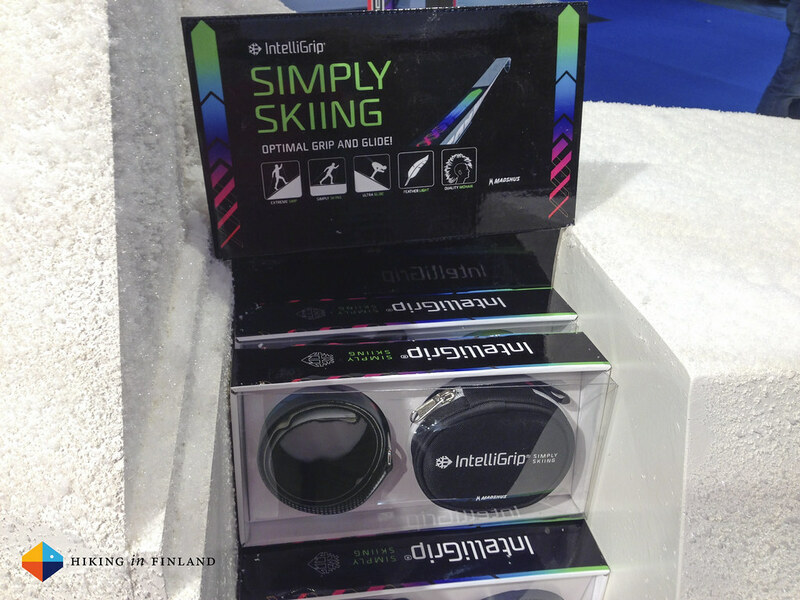 Other than the full-length skins for alpine touring skis, IntelliGrip has the climbing skin only in the grip zone of the ski – just like wax or klister. 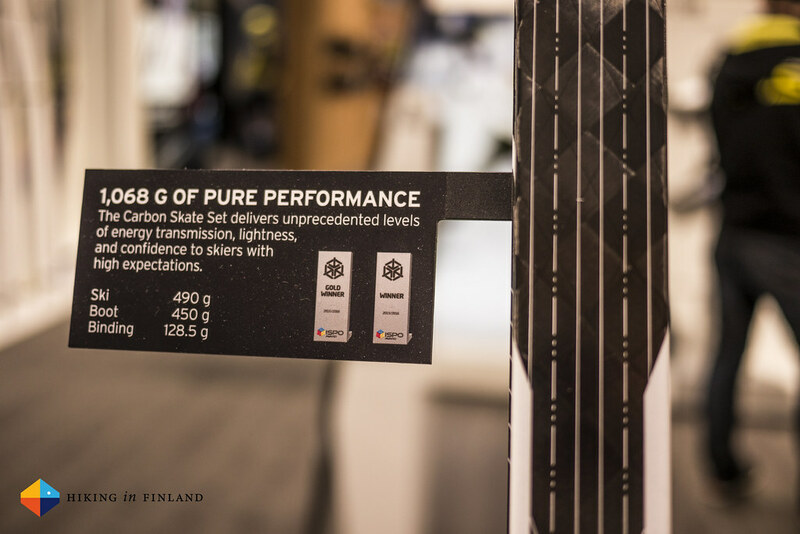 The entire front part is made from polyethylene, the same material as the base itself, and since it worked so well, Madshus now integrates IntelliGrip into the base of skis. 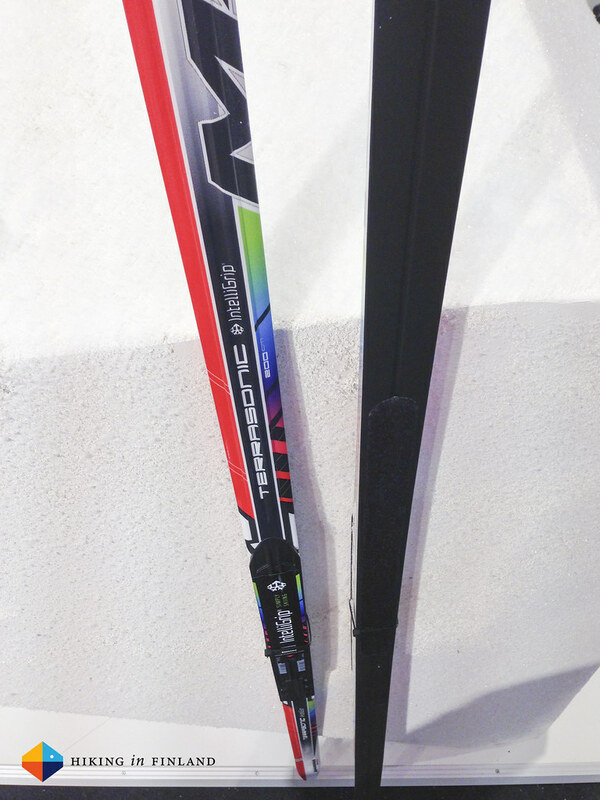 The first model is the Terrasonic IntelliGrip Classic, a ski made for ambitious cross-country skiers eager to take advantage of a high performance waxing ski but who want to avoid the disadvantages of a conventional NoWax-ski. It never requires the application of grip wax and avoids the typical disadvantages of NoWax-skis: the glide is much better than on any kind of fish-scale patterns and there is no rattling noise in an icy track. 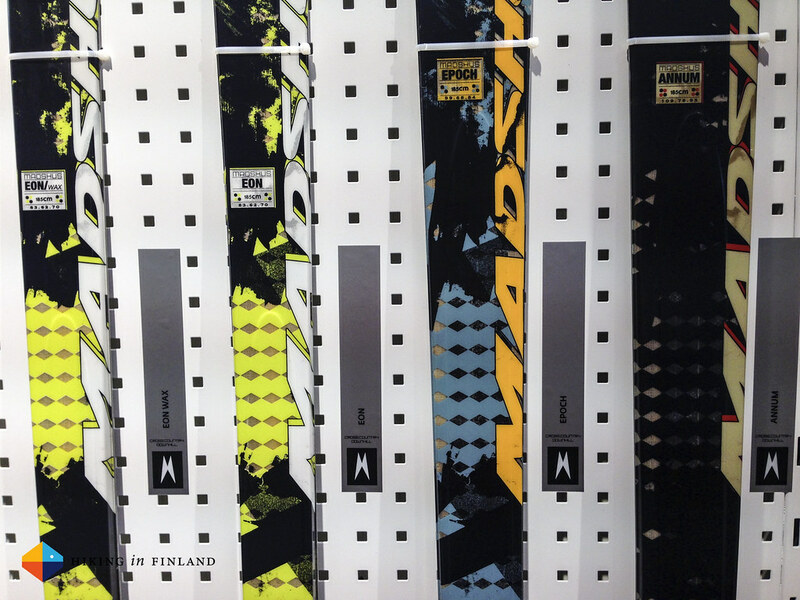 More interesting for the ski-touring/ backcountry cross-country skiing enthusiast, the Backcountry skis from Madshus got a face-lift and now looks freshers as my old ones. 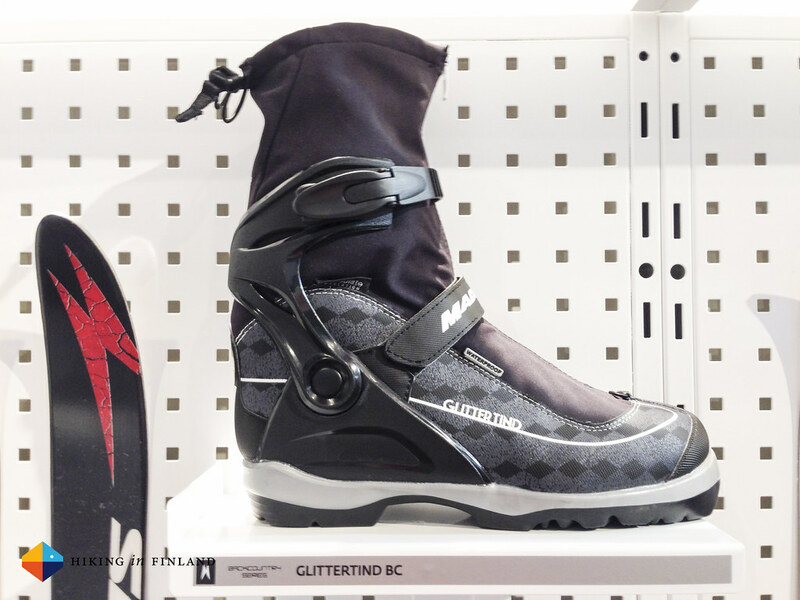 Also the Glittertind BC Boot got a small update as the cuff is now a lot higher and is made of MemBrain® softshell material, which I think is a good development. 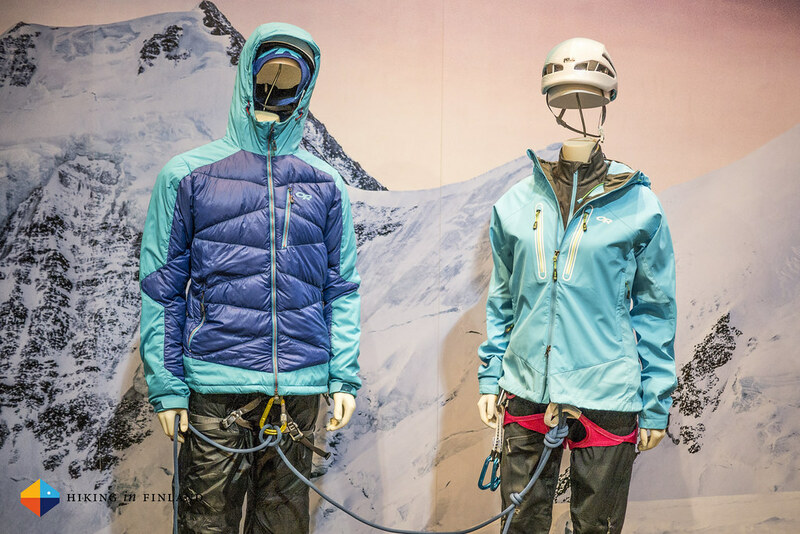 Millet showcased their Triology Series, which is made for alpine pursuits in winter: Ice climbing, mountaineering, winter ascents, mixed climbing. Inspiration for the line comes from the winter ascents of the Eiger, Matterhorn and Grandes Jorasses North Faces of Eric Escoffiers in 1987. 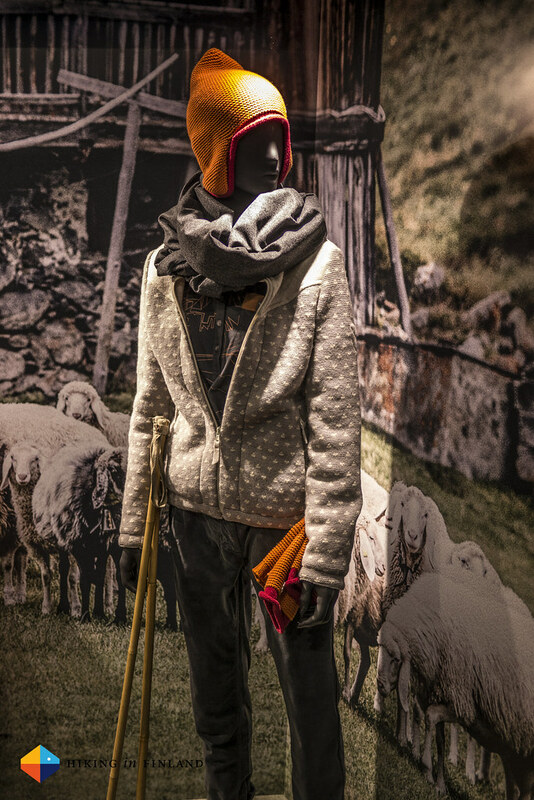 The garments are made of the most modern materials available and the “ingredients list” reads like a who-is-who: Polartec® Power Wool™, Polartec® Thermal Pro® Highloft, Tecnowool®, Gore-Tex® Pro, Gore-Tex® Helios Stretch, PrimaLoft®, Windstopper®, Schoeller® Wool Naturetec and K DRY™ - you see these garments will be made for cold, harsh weather and will keep you toasty and dry. Just climbing you need to yourself! 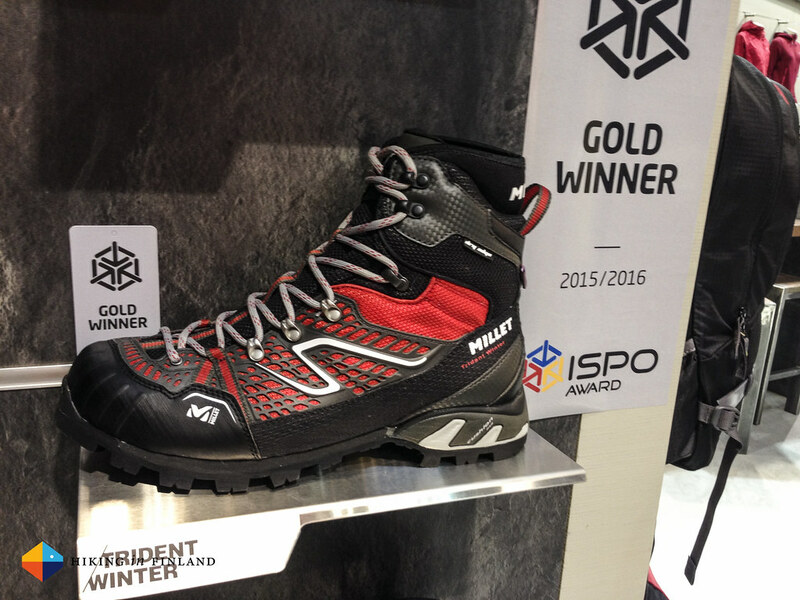 The Trident Winter Mid from Millet is an ISPO Gold Award winner and a lightweight winter boot for all you winter activities - from snow shoeing to glacier hikes, the Trident does it all and keeps your feet toasty thanks to a Primaloft insulation. It’s waterproof and breathable, too, with a DRYEDGE Membrane, and a Vibram sole to give you grip. It is crampon compatible and should be ideal for snowshoeing. I think about half of the garment manufacturers I visited had these cuffs where the stretchy rim which keeps the sleeve in place was a few centimetres inside, and not at the end of the sleeve. 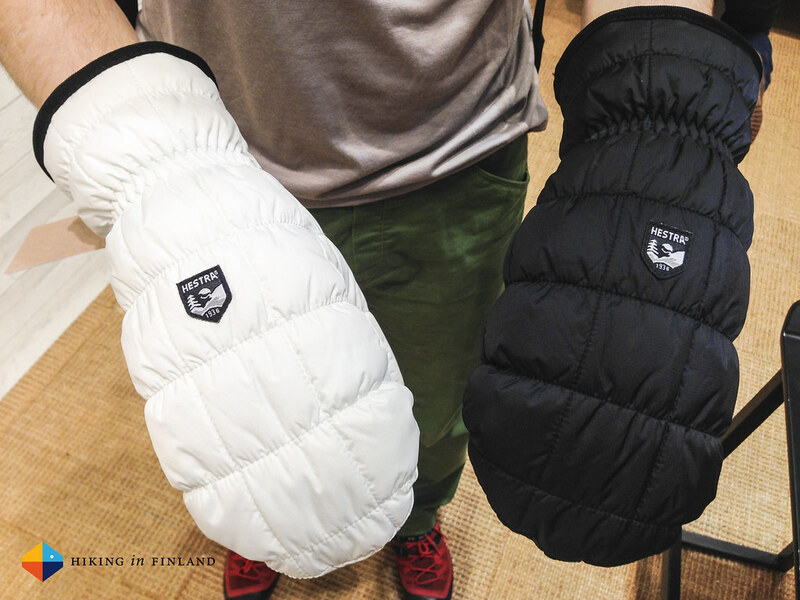 This does make a lot of sense: It’s easier to put gloves on, or have “free” hands when the gloves are off but at the same time they bring the insulation point further down over the wrist and make the end of the sleeve straighter. The cuffs themselves also should get less dirty and it also might mean warmer wrists as he puffy layer covers them rather nicely. I think it’s a nice development and I’m curious to see if it is better than the traditional cuffs. 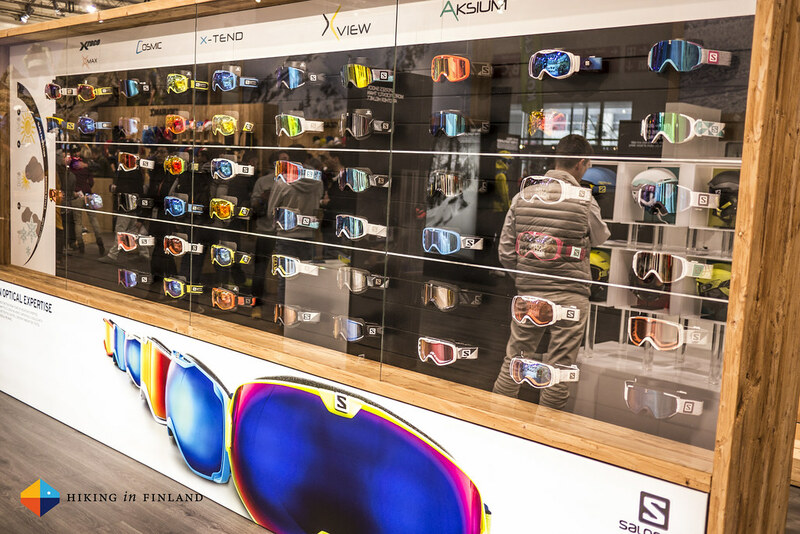 The Boa Closure System has found its way at this ISPO into a lot of shoes, ski and mountain boots. I tried it on a few shoes and it was indeed very nice to get a good, tight fit and easy to “open” the shoe again. 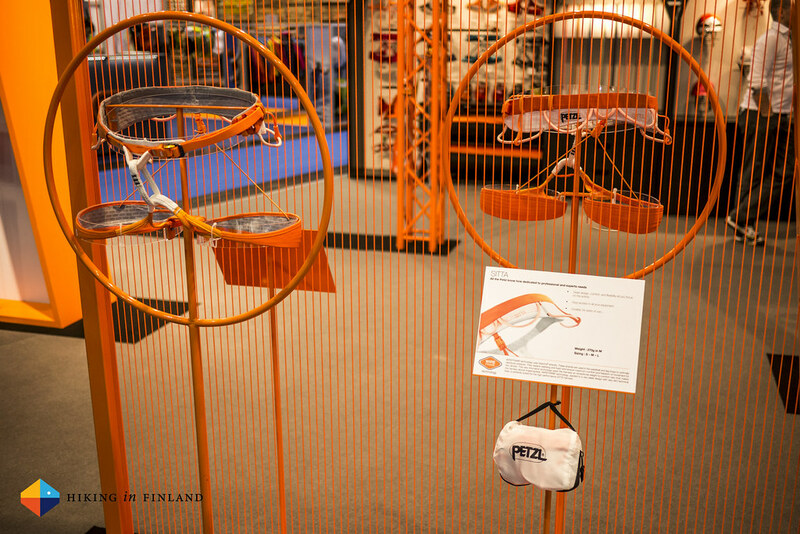 Kamik even used this technology in kid’s boots, which could make it easy for kids to close their shoes on their own. 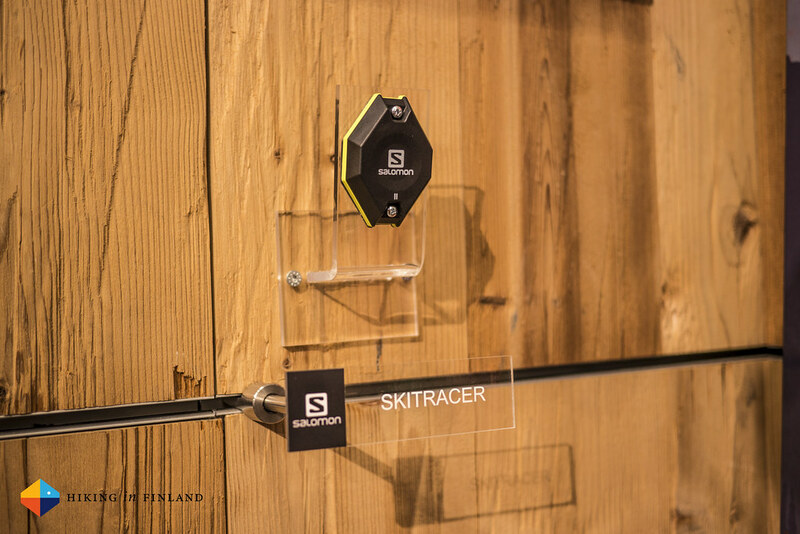 But also trailrunners, hikers, Cross Fitters and Skiers will be able to use the Boa technology, and I reckon it will increase even more in the coming year. Body Mapping isn’t really anything new, but quite a few companies have made some nice efforts with their garments. 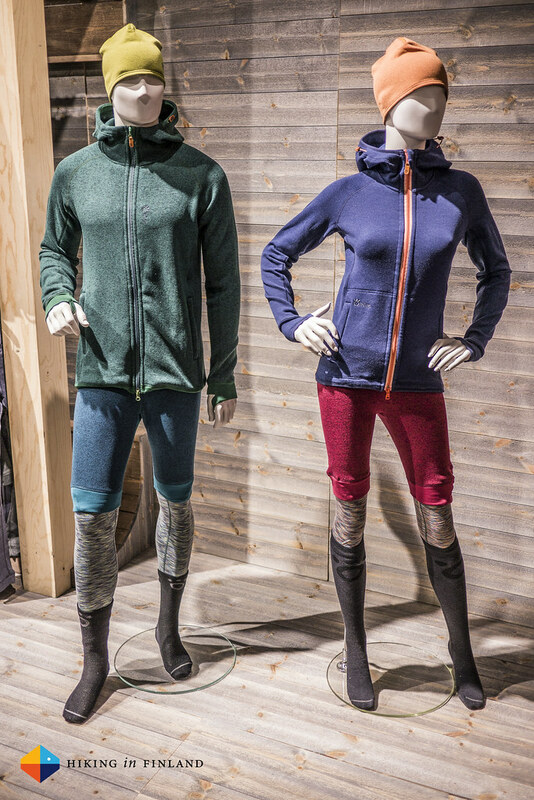 It just makes a lot of sense that some garments are windproof in the front and super breathable in the back, with stretchy sides for freedom of movement and warm, toasty hoods. There was, however, still a lack of aymmetric zippers in the face area. Lets hope a designer or two reads this and pleases me with asymmetric zippers in the 2016/ 2017 line-up! The development of Urban (Outdoor) Styles and collections also is on the rise. As I’m myself am getting more interested in this area you might be able to see some more articles on this topic in the future, but for now: If you’d like to wear a Gore-Tex coat because it pours cats & dogs, there’s a handful of outdoor companies which make those - and many more casual outdoor garments - in urban styles, so you don’t need to wear your bright green hardshell to the next client meeting. This will only be of interest to those who really need to look the part when they go to clients, or those who simply don’t want to wear their “outdoor uniform” in the city. Although, then fellow citizens might not think you’re an Extreme Mountaineer. 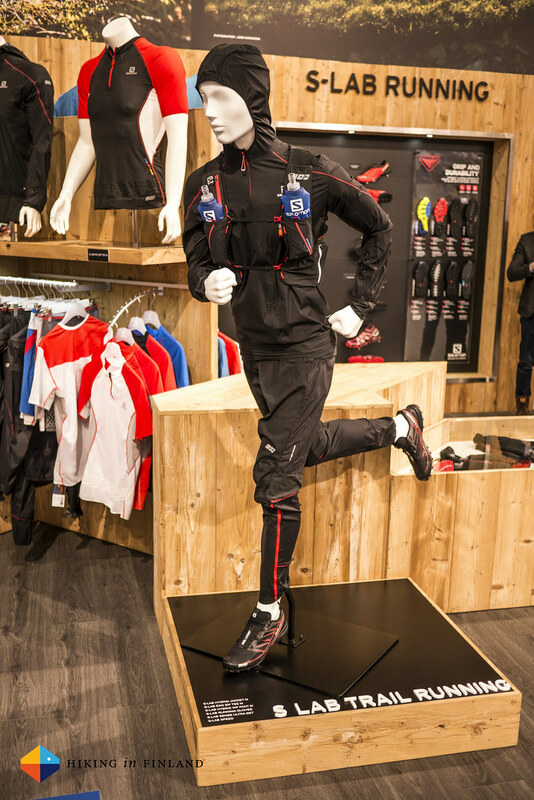 There was a host of other great bloggers at the ISPO and I was fortunate to meet many of them. 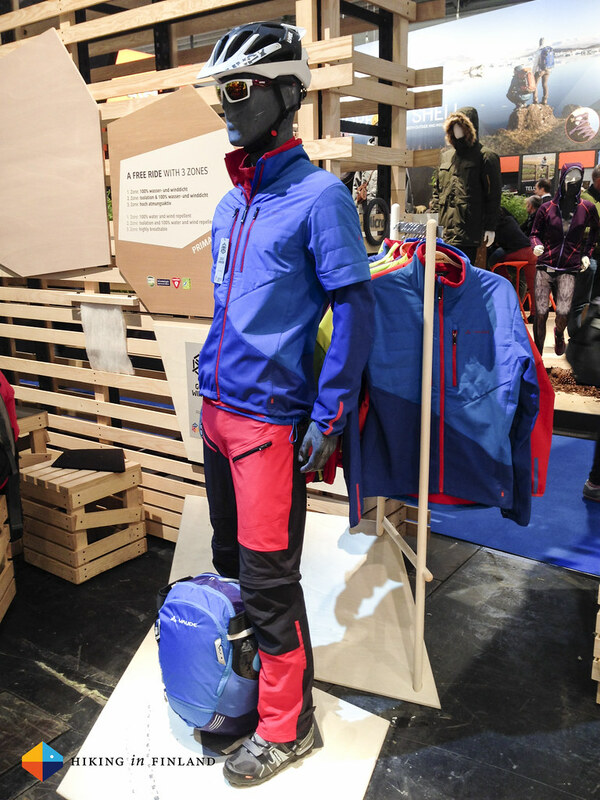 Here’s in no particular order the outdoor bloggers who also wrote about the ISPO 2015: Outdoor Mädchen, Wander Video Blog, Klimbing Korns, Auf-den-Berg.de, Outdoor Blog, Zwerg am Berg, Lina Luftig, Up to the Top, Wusa on the Mountain, Gipfel Glück, Outdoor-Blog, Wandersüchtig and airfreshing.com. I had close to 40 meetings in three full days, so you get slightly blind to the stuff you’re being presented. Some stuff is really nice, innovative and cool, while other things are just the same old in a new colour. There are these companies who are honest about that fact, while others do as if they re-invent the wheel every year anew. This can get rather tiring if you get to see yet another synthetic/ Merino wool fabric mix that’s supposed to be the best thing yet and hasn’t been done before. Strangely I have been wearing that kind of garments since a while, though they didn’t have the XYZ Logo on it but were from ABC. Ah well, better take another sip of that good Espresso so I have enough processing power for the rest of the meeting(s). Similar feelings I get with “Our Responsible Down Standard” being flavoured in yet another new name you haven’t heard of before and a totally fascinating story, which, thanks to the coffee you just had, happily doesn’t make you yawn. I’m not working for one company, so I get to see a bit more. I also read (BOOKS! Magazines! Imagine, death trees) and am curious, trying to question some things. So that’s why I don’t make somersaults if presented the best new thing for 2015 since, ähem, yeah, wait, since when exactly? Except the first one - the Ortovox SAM 3D - nothing utterly blew my mind, but as I wrote in my post about the Ortovox news and the SAM 3D, I think this is a superb invention which was - when you see it - so obvious that one can but wonder why something like this hasn’t been thought of before. 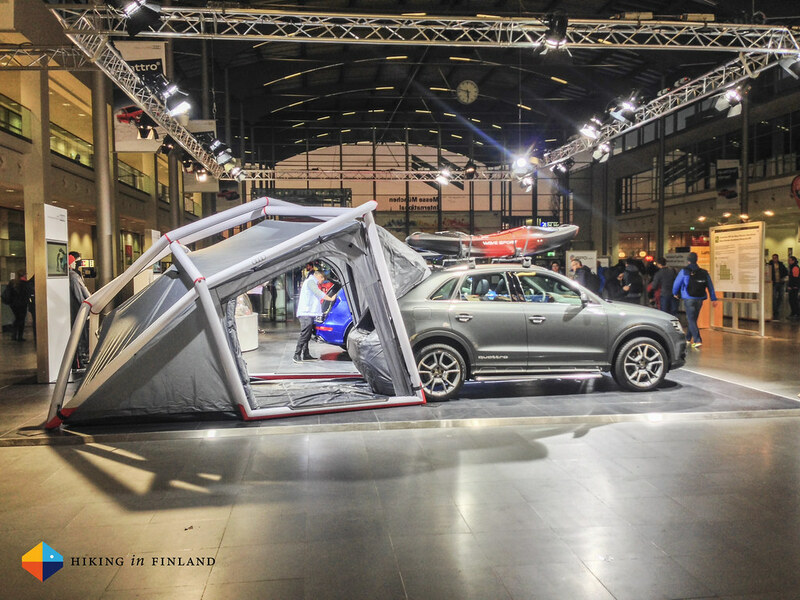 It’s a very nice executed thing that brings the outdoors indoors and makes your time in the mountains more safe and fun. And that’s what it’s all about, in the end, isn’t it? 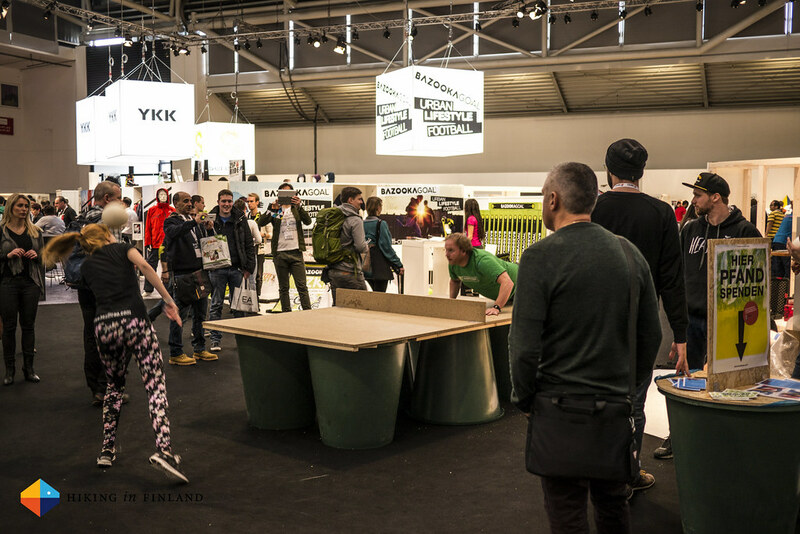 And if you liked The ISPO News articles, buy me a cup of coffee or two and then share it with your friends, fans & followers on Facebook, Twitter and Google+, because sharing is caring. Ah ja, wait: I was handed a prototype of a fluffy thing that my ideas and feedback has been going in to since last year and which I have tested sicne I’m back home. That is a pretty neat thing, which definitely should be on your list of “things to watch” if you like fluffy warm things.